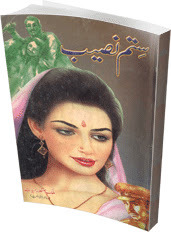 Sitam Naseeb novel authored by Malik Safdar Hayat Ex DSP. Sitam Naseeb contains a collection of four best social criminal and investigation stories in Urdu language. All stories of this novel are based on the investigations in different criminal cases of Malik Safdar Hayat a retired Deputy Superintendent of Police. Siyaah Kaar by Malik Safdar Hayat. Visit the following links to read online and download complete novel in Pdf format to enjoy offline reading of this tremendous novel. salam sir. your posts are too much interesting and i like it. the only problem is that the pages of the books are always covered with NAME OF THE WEBSITE or the admin of this website which covers the reading material i.e. cant be read. so plzzz remove these discrepancies. i shall be very thank ful. thank you sir. Dear Abid Ullah Sahib. We are already working on this issue and try to remove all watermarks that covered the real content of the books and update it again. Thanks for you interest in our website.